Crafted with a titanium case for unrivalled strength and scratch resistance, this innovative radio controlled timepiece receives signals from satellites orbiting the earth, delivering incredible accuracy. And because it features Eco-Drive technology, it will never need a change of battery. Styled with a black multi function dial with date window. 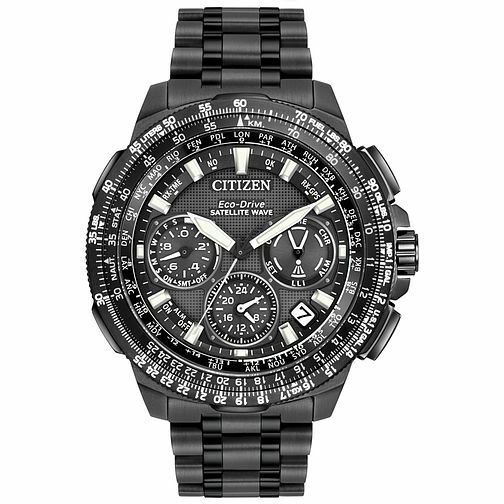 Citizen Eco-Drive Satellite Wave Titanium Bracelet Watch is rated 5.0 out of 5 by 2. Rated 5 out of 5 by Anonymous from Superb watch I was looking for a new watch, and wanted a black edition. I also specified solar powered and automatically set. The Citizen GPS series seemed perfect, and my Titanium watch is perfect. I ordered on-line and found a sensible price with a discount voucher code. The watch arrived the next day and I took the watch to my local H Samuel branch who expertly fitted it. The whole transaction was very smooth, and the product is everything I dreamed it could be.